Thomas Lennon Joins Sean Hayes’ New Comedy Series for NBC!!! Thomas Lennon, or otherwise known as Lt. Dangle from ‘Reno 911‘ is making a grand return to primetime television this year. Lennon will co-star with Sean Hayes in a new untitled comedy sitcom from Hayes and Victor Fresco. Unfortunately, the pilot will be a multi-camera project, which means the series will be too if it gets picked up, which I’m sure it will. This new comedy will follow Sean (Hayes) whose world is turned upside down when his 14 year old daughter moves in, meanwhile his unsavory and ill-tempered boss, Max is making life hard on Sean and the rest of the employees. Lennon will play Max, which I can’t wait to see. Lennon is a busy man these days as he has several very cool projects in the works including a remake of ‘Baywatch‘, ‘Night at the Museum 3′, and ‘Hell Baby‘. I’m not a huge fan of multi-camera sitcoms, but this one has me intrigued. 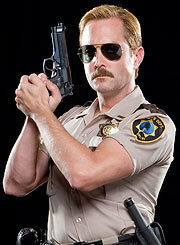 The world needs more Thomas Lennon and or Lt. Dangle. Your thoughts? This entry was posted on Tuesday, February 19th, 2013 at 12:26 am	and is filed under News, Television. You can follow any responses to this entry through the RSS 2.0 feed. You can skip to the end and leave a response. Pinging is currently not allowed. « Kathleen Kennedy Leaves ‘Jurassic Park 4’ for ‘Star Wars’!! !